Everyone likes a powerful amplifier – it’ll develop better bass, be punchier and be much less likely to be driven into distortion. But how do you know how much RMS power an amp’s got? There’s usually no point in reading the numbers written on the side – quite often they’re pure fiction. 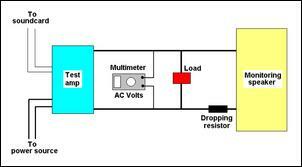 Measuring amplifier power is actually pretty straightforward and can be done for near zero cost. This story primarily looks at testing home sound system amplifiers but exactly the same approach can be taken with car amps. If you’re anything like me, you can’t resist picking up a bargain. Especially when it’s a cheap piece of electronics that someone in their, er, wisdom has decided no longer has the right fashion look. Take amplifiers. Visit (in declining order of salubriousness) secondhand stores, garage sales, roadside hard rubbish collections or the tip and you’ll find a host of amplifiers that are available at ridiculously low cost. 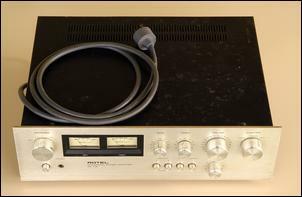 Take the Rotel 712 integrated stereo amp shown here. It cost me $8. Yes, that’s eight bucks. What was wrong with it, you ask? Nothing.... Similar bargains can be had – recently I bought a Rotel (yep, I like that brand) RX-203 stereo receiver for... wait for it, $3. So what was wrong with that one? Well, I haven’t tested it yet but I’ll bet that again it works fine. But talking about testing.... Only a few days ago I was like many of you – I thought that any meaningful testing of an amplifier needed stuff like oscilloscopes, standalone frequency generators and specific audio test gear that I don’t even know the name of. But then I found out that all I’d need is a digital multimeter, my trusty PC, a few cheap resistors... and a jug element. But the first things that you need are you ears. In the following discussion about technical testing techniques, it’s possible to forget that the reason that you buy an amplifier is to listen to it. And hey, if you like the sound that it makes, what the hell do any figures matter? In the following testing regime your ears will be used to assess the purity of a quiet test tone and also to listen to background noise that might exist when there shouldn’t be any. You’ll also need a decent digital multimeter. Since these days ‘decent’ applies down to multimeters costing from about $60, almost any near-current meter will do. It helps if it can measure frequency (but that’s not vital, it’s just a good check) but it must be able to measure AC volts and resistance. A cable that connects the sound card output of your PC to the amplifier inputs will also be needed. Typically, this is a cord with a stereo 1/8th inch plug at one end and two RCA plugs at the other. And now we come to the jug element. Or elements. Yes, you’ll need one or two electric jug elements (just the mains power sort that you can buy at any hardware store or supermarket) and a Pyrex or high temp glass bowl that you can fill with water before suspending the elements within it. If you haven’t guessed, this is our amplifier load – and a bloody good load it is, too. Turing the jug elements into the load is easy. If you use two (as I did), unwind enough turns of wire from each element that the remainder left on each ceramic former poses an 8 ohm resistance when measured with the multimeter. Then when you wire the modified elements in parallel, you’ll have a very high power load with a 4 ohm total resistance. 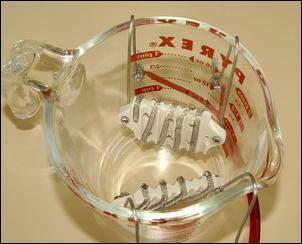 Place the elements in the Pyrex jug of water and then use heavy gauge wire to connect the jug elements together and then to the amplifier. Warning: If you are testing a high powered amplifier, this water can become hot enough to burn. 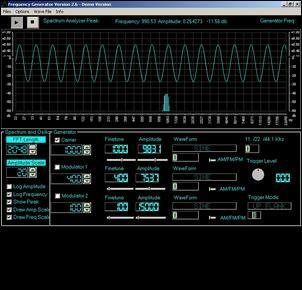 To generate pure sine wave test tones you’ll need to download some frequency generator software off the web. This is available either free of charge or with a 30-day free trial period. We used PAS Products Frequency Generator version 2.6 (www.pas-products.com) but there are plenty of programs around – a web search will soon find them. Practice playing the generator through your normal PC speakers until you are able to do two things – generate sine wave signals over a 20 – 20,000Hz range, and vary the volume level. The latter is important – some frequency generators make it difficult to vary the amplitude (volume) of the test tones and so you should check that this function exists. If you want to, you can burn a CD with all the test tones on it and then play it back through your car CD player. That way, you can easily power the amplifier from the car, simply replacing the speakers with the jug element load and running the standard speakers with a dropping resistor as the low volume monitoring speaker. 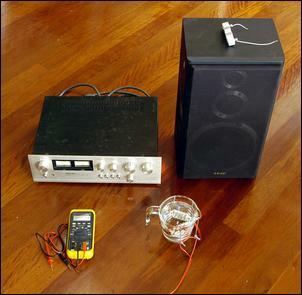 Fill the load with water and then connect it to one channel of the amplifier. Wire the monitoring speaker in parallel with the load – that is, connect it to the same channel. Don’t forget that you’ll need to put that 150 ohm, 5 watt resistor in series with the feed to this speaker. Set the multimeter to VOLTS AC and then connect it across the same channel. Connect the input of the amp to the sound card line-level output. Open the frequency generator software and select a frequency of 1000Hz. This diagram shows the set-up. When you turn up the volume output of the frequency generator software, you should hear a faint 1000Hz test tone coming from the speaker and read an AC voltage level on the multimeter. If everything is working as it should, turn up the volume, listening intently to the test sound and watching the changing figures on the multimeter. When the volume reaches a certain point – called ‘clipping’ – the sound from the speaker will suddenly and clearly distort. Take note of the multimeter reading just before this occurs and then quickly turn the volume back down. On my $8 Rotel, the left-hand channel yielded a result of 19.6V before clipping. So how do we turn this into a maximum power figure? It’s easy – just square the number (ie multiply it by itself) and then divide that by the resistance of your dummy load. So that was (19.6 x 19.6) over 8.5, which is 45 watts RMS. I then repeated the test for the other channel and got a figure of 48 watts. Hey, not bad for an $8 amp, eh? Now you might be saying that it’s great that his amp has 45-odd watts per channel, but that’s only at 1000Hz. What about over the rest of the frequency range? This introduces the idea of frequency response – how flat is the response of the amp? Testing this is again very easy – the set-up is the same as shown above. Leave everything in place as it was for the previous test, but reduce the power output to 2 or 3 on the volume scale (ie adjust it to what normally would be a quiet listening level) and decrease the frequency of the test tone to 20Hz. (You will no longer be able to hear it from your speaker – the frequency is too low). If using the car head unit, make sure that all the tone controls are set to flat (ie zero adjustment) and switch off the loudness button. Measure the input voltage to the amplifier. For example, say it’s 0.5V. Then measure the output voltage of the amplifier, and note this value. Next, change the input frequency to 100Hz and adjust the input level until the input signal has the same voltage (0.5V in this case) as for the previous measurement. Again measure the output voltage. Keep doing this right through the frequency range, up to 20,000Hz. Make sure that the input voltage doesn’t change – you may need to tweak the volume control on the frequency generator (or car head unit) to achieve this. And of course, you don’t need to do the measurements all in small increments – this table shows the results of this testing on the Rotel. As you can see, with a constant input voltage, the highest output for the right channel was 2.2V and the lowest, 2.1V. So it doesn’t vary much, does it? However, how do we express this variation in that unit beloved of audio engineers – dB? Again, it’s easy. Simply divide the highest figure by the lowest, log it, then multiply by 20. So between 20 and 20,000Hz the biggest variation away from ruler flat response for this channel is just 0.4dB. The other channel measured a little worse at 0.5dB. Those are very good specs for an amplifier – those eight dollars are looking better and better spent! The signal/noise ratio is a measure of how quiet an amplifier is: for example, during passages in a song when all the sound stops, you shouldn’t be able to hear anything – no hiss, no hum. Well, not from the amp, anyway. Again the dummy load, speaker and multimeter can be left connected as we had them before. Wind up the volume control to the level at which clipping previously occurred (eg ‘8’ on the scale) and read the no-input-signal output voltage. It will be very low. In the case of the Rotel, it was 2.6mV. Now a 77.5dB dynamic range isn’t wonderful – in fact it’s pretty bad, and by far the worse spec of this amp. And that brings us to another technique. Connect the amp to its normal speakers (no resistor needed) and make sure that there is no input signal (But keep the resistor across the input). Then turn the amp right up and listen intently to the speakers. The more noise that you can then hear, the poorer the signal/noise ratio of the amplifier. It’s possible to gain a lot of information about an amplifier with very little effort – and even some genuine excitement. Testing an amp at full sine-wave power is like seeing a car giving its all on a chassis dyno. In just the same way, expect things to get hot and bothered if anything in the amplifier design is less than optimal (eg amp heatsinking, power supply capacity, etc). It’s another cheapy buy but not in the same class as the Rotel covered in the main text. 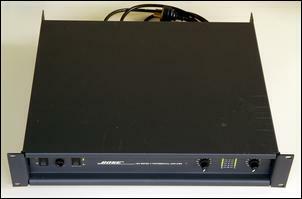 I bought this Bose professional amplifier by tender (so no extensive testing was allowed prior to purchase) for just AUD$480. That’s pretty good when the new price is US$2000 and the thing can develop no less than a claimed 450 watts/channel into 8 ohm loads! But once I’d got it home I found that my new purchase wouldn’t develop any watts into any channels – instead it just blew the circuit breaker on the external power board. Inside the case, the transformer was simultaneously getting hot... One VERY expensive transformer later (and there went nearly all of the cost advantages of my ‘bargain’!) I was ready to do some testing.